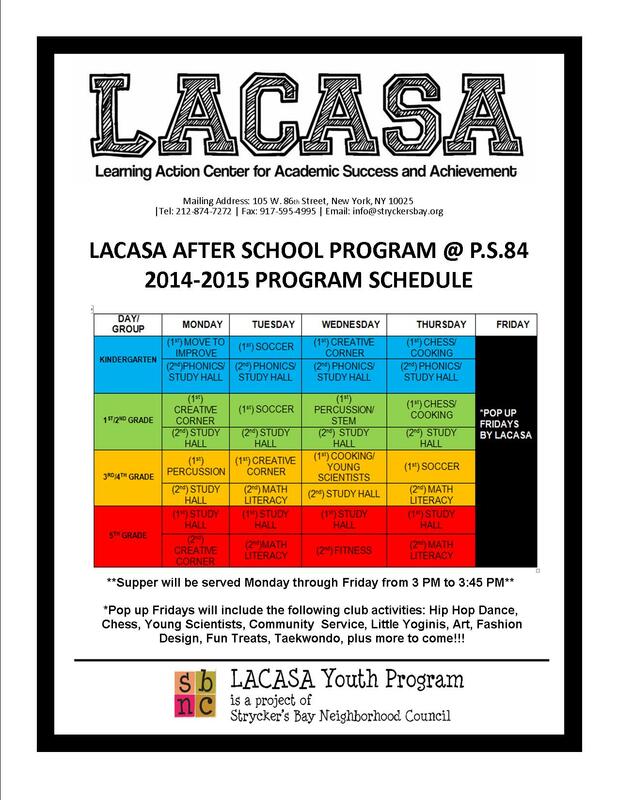 Our afterschool program located @ PS 84 running from 3:00PM-6:00PM. We offer a comprehensive package that includes a variety of activities. 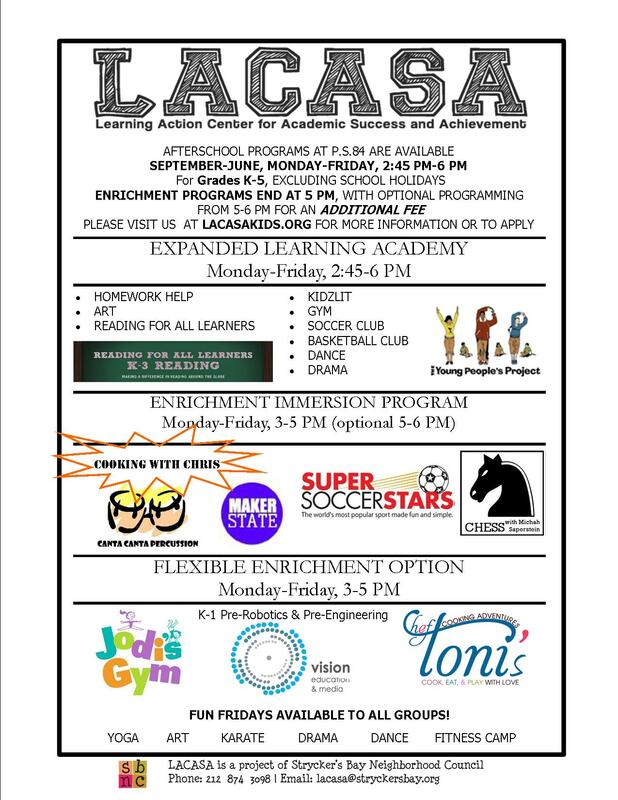 We also offer “add-on” clubs where outside providers are contracted to provide enrichment as part of LACASA’S Flexible Program. We hope you are having a relaxing and peaceful summer! With school right around the corner, we will begin registration on today to Friday, September 1st. This year, our program will operate from September 13th, 2016 to June 17th, 2017 at P.S.84. Families who submit applications during this time, will start on September 13th. Any applications we receive after this date will be put on to our wait list and will not begin until Monday, September 26th. Our standard weekly program fee is $125. Please contact Christine Byrd-Tucker, Program Director, to discuss our other payment options and plans. Fees are determined based on your current school lunch letter. This year, we are offering 10% off of your monthly bill if you enroll in our auto-debit program. This deal is only available to parents who are enrolling their child into our full five day a week program. This offer is not available to families who use our drop in services. The first payment for after school is due by September 6th. More information regarding payment schedules will be emailed shortly. We have 150 program slots available this year. Of those, we have 60 program scholarships available. If you feel your family is in need of one this year, please contact Christine ASAP. PLEASE NOTE: If your family receives a scholarship, your child must be in attendance four out of five program days per week. Our office hours will be held Monday through Friday from 11 AM to 5 PM at our main office located at 486 Amsterdam Avenue. If you need to speak with someone 1:1, please email myself or our Program Director. If you mail in your application, please send Christine or myself an email, so that we can put your name on our registration list. Once your application has been reviewed and processed, you will receive a confirmation letter via email and mail. If you do not receive this, then your child is not officially registered in our program. This year, the tentative date for our program orientation is Wednesday, September 7th. More information will be sent to you in the days leading up to orientation. We look forward to a great program year! For our Spring 2015 semester, we are introducing new classes to our flexible options program. Please click the link below to learn more about the new activities we have to offer! Our Spring 2015 semester begins January 15th, 2015. Our program schedule and activities we offer have changed. Interested in registering your your child(ren) in our after school program at P.S.84? Check out our 2014-2015 program schedule, click the link and complete our parent letter and application, and send it back to us via email (info@stryckersbay.org). Want to drop it off at our main office? We are located at 696 Amsterdam Avenue (between 93rd and 94th street).